Actually, it's a few more clicks than just one. You have to allow the app access to the accounts and LIKE the FB Fan Page separately, but it sure makes it easy to hook someone up with those four social media sites/page all in one place. Click above to connect with me. The buttons are already checked. Remove any accounts where you do not have an account and click the orange button. LIKE the FB Page, first. Try it out. 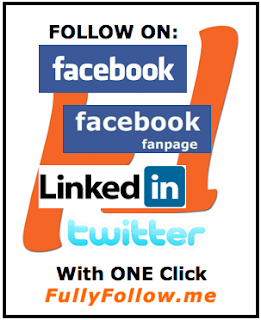 Click on the orange button above, it will take you to my FullyFollow.me page. Connect and then set up your own account. All you need to do is enter an email address, confirm by clicking the link sent to that email, hook up your accounts and you're ready to go. FullyFollow.me offers basically one-click friend, LIKE, connect or follow. It's too easy.